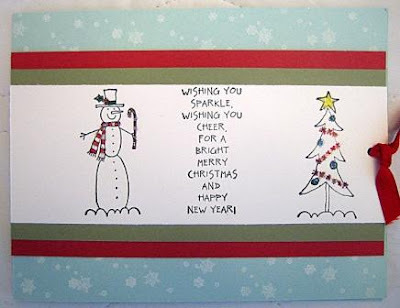 A couple more Christmas cards for ya!! by Noreen. Wow! I just love snowmen!!! OK, you are probably NOT going to believe what this gift card holder is made from!!! Yep a toilet paper roll!!! haha! 1.Flatten the tp roll as flat as you can. 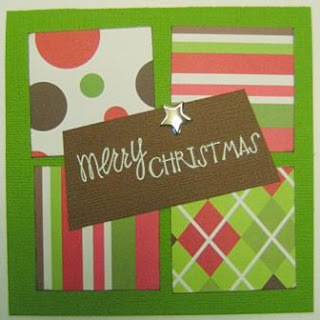 2.Choose your patterned paper and cut it 4 in.X6 in. . It may have to be trimmed on the 6 in. side after you start gluing it on to the tp roll. 3. Cover one side of the tp roll with glue and adhere the pp to it. I left some for a flap. Fold the pp and put glue on the other side and this is where you may have to trim one side. I needed to trim mine a little. 5. Place a line of glue on the inside of the tp roll on only ONE side. Clamp it again for the glue to set. 6.While you are waiting for this to set, you can make the tag that you can slip into the opening. Cut a piece of 4 3/4 in. x 2 in. piece of coordinating cardstock or patterned paper. 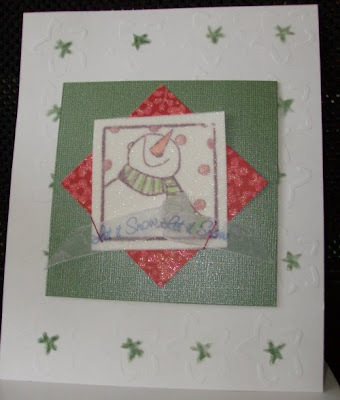 Trim one side to make it look like a tag and punch a hole in it to place a piece of ribbon on the tag. Add the gift card to the tag now. 7. 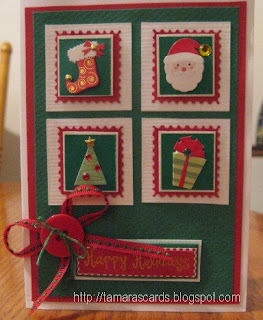 Now ,you can decorate the front of the gift card holder any way to choose.I chose to cover up the fold where the pp met at the top with a piece of cardstock left over from the tag and added a piece of ribbon as well. 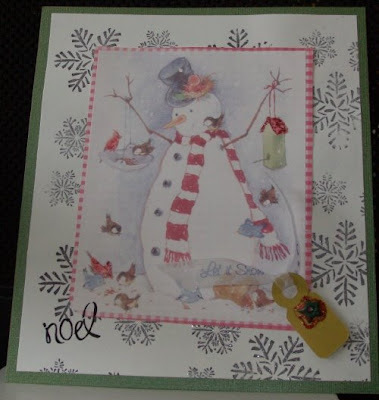 I added an embellishment and a little card with a message on it. 8. Time to tuck the tag inside the holder and voila.You are done! Let me know if you try this! I would love to see it!! 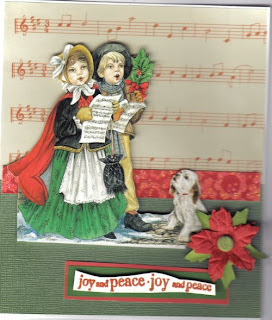 Some more Christmas Card inspiration!!! 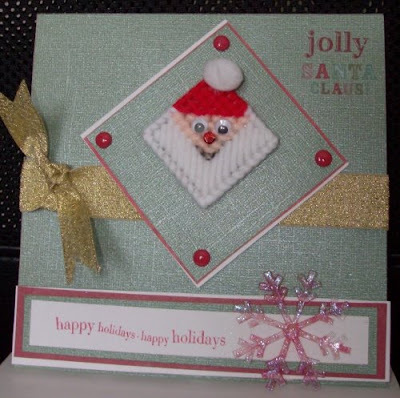 Here are 4 more cards that Betty Ann created!!! Aren't they great!!! Bake at 300 o for 10 minutes. Cool completely. Spread over wafer layer. Prepare an envelope of Dream Whip and fold in 1 cup crushed pineapple (well drained) Spread over the second layer. Top with the reserve crumbs. 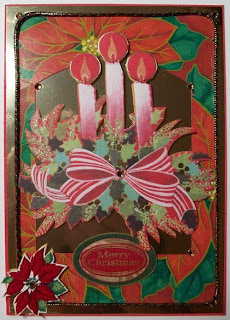 Click here to see a tutorial on how to alter a Nestle Cocoa Box. It's a cute idea!!! Hope you are all having a great 2009 so far!!!!! 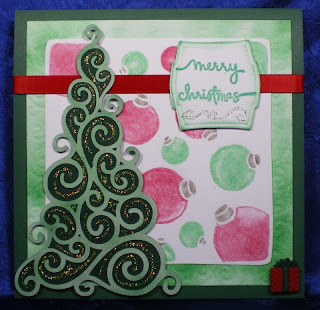 I've still not totally gotten back my scrapping/cardmaking mojo yet! Hoping that after this weekend I will!!! 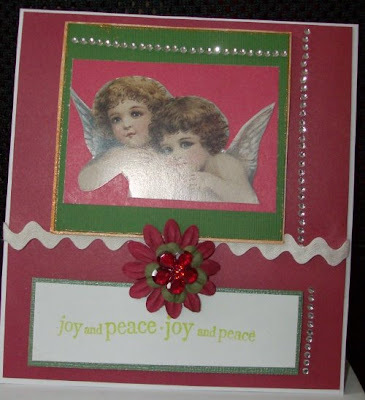 Create a card with VERY tradition red and green colors and a stamped OR a rub-on sentiment! 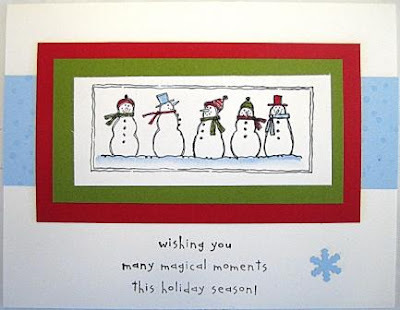 Can you imagine that at the end of this year, if you do ALL the challenges and make at least 5 cards a month, you'll have 60+ Christmas cards!!! Wow! 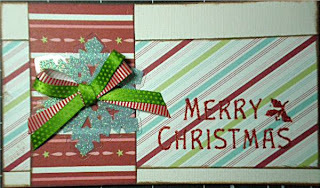 Please upload your cards to your blog, a gallery, or photobucket and remember to give us the links to see them.Thanks! Unfortunately there was no winner for the monthly challenge for December. Oh, and our numbers are rising like CRAZY! At the end of November we were at 14 000 visitors and now at the beginning of a new year we are OVER 20 000!!! Wow!!!!!!!!!!!!!!! Unbelievable!! !